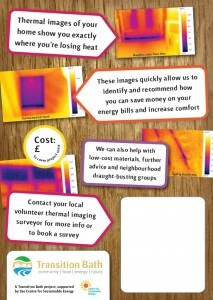 Transition Bath’s Thermal Imaging Project aims to help the residents of Bath reduce their energy bills and carbon emissions by providing low cost thermal imaging surveys. We aim to increase the take-up of recommended measures following surveys by providing low cost materials, further advice and neighbourhood draught-busting groups. This year we have trained over 50 volunteers to use the camera and provide advice on how to make your homes warmer and reduce your energy bills. Many of the measures we recommend only cost a few pounds each and often payback within a year. 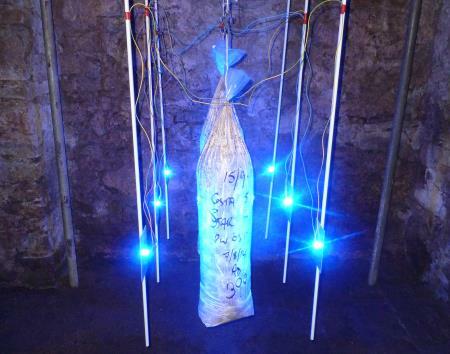 The project has been run jointly with Energy Efficient Widcombe and Bathford Energy Group. The website aims to provide examples of issues we have already spotted at homes in Bath, advice on how to fix the issues, estimates of the costs of materials and potential savings. We also plan on developing case studies to provide examples of what can be achieved. 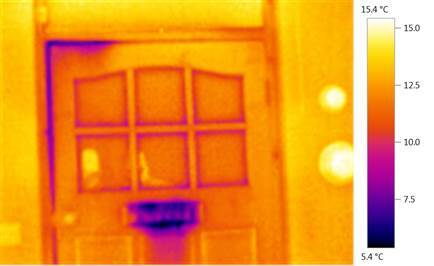 The main benefit of a thermal imaging survey to in the space of 30 minutes identify many issues in a property. Often the insights the camera brings are issues that the home owners were not previously aware of and in other cases it is something they were aware of but until they see the images they haven't had the motivation to fix the problem. The winter of 2013/2014 was the first time we have run the project and this year was really an experiment to determine the best way of running such a project. We wanted to try to ensure that home owners used the opportunity to make a difference to their homes - so we have been trying to focus on outcomes by trying to encourage owners to fix the problems the camera highlights. We have been running workshops to teach people how to install draught-proofing and insulation, and following a CSE grant we have been able to bulk-buy material allowing us to offer home owners cost effective material to refurbish their homes. We deliberately decided this year to restrict areas in which we offer surveys to the immediate neighbourhood of our volunteers. We are hoping next year with greater experience and more time to widen the survey area. Each training session took about 2 hours and we managed to train 20 volunteers this year. We are planning on having a 'wash up' session at the end of April to discuss how we felt the project went this year and how we could improve on it next year. This project is still 'work in progress', we hope to learn from of experience our first year to make the project more effective in subsequent years. 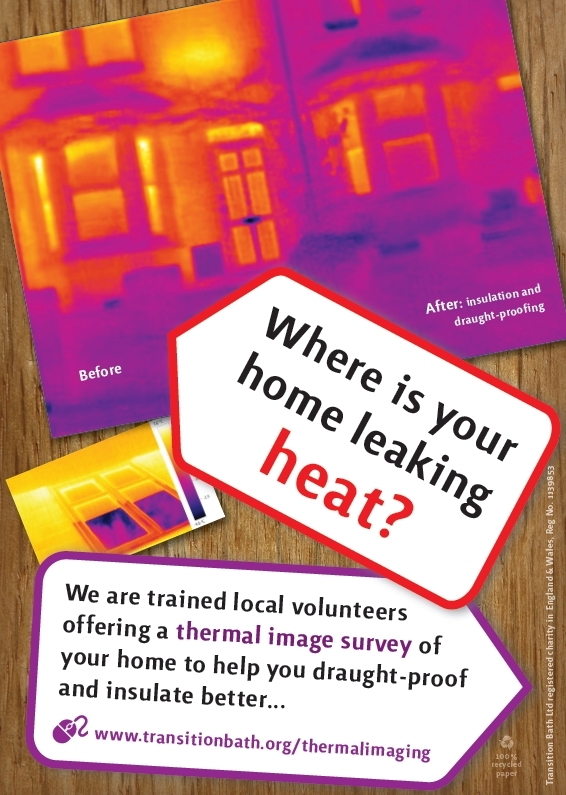 If you are a home owner who wants their home surveyed, or are interested in being trained to use the camera and provide surveys or are a another community group who want to share experiences of using a thermal camera please mail us. Heat coming from radiators can be observed from the outside of many solid walled homes in Georgian Bath. The extent of this 'problem' is perhaps the most surprising result from our work to date in Bath. In general we recommend the installation of radiator reflectors which we can supply at about £3 per radiator paying back its investment in under a year. A common feature of many homes in Bath is missing or defective wall insulation of both older and more modern homes. It is also common to see lintels and sills thermally bridging between the outside and inside of a house. Both problems are very difficult to fix. 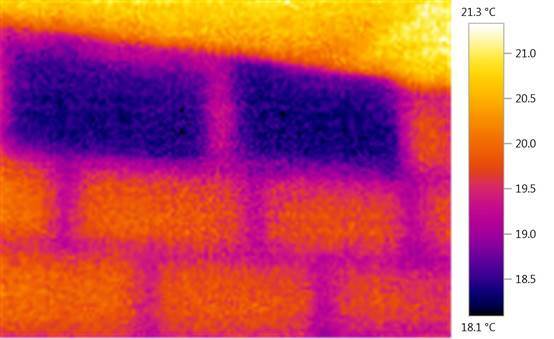 The example above shows the high thermal conductivity of 2 high density blocks in a wall surrounded my more thermally insulating thermalite blocks - this information is impossible to see without the camera as the blocks were hidden behind plaster. In this example there was no loft insulation, in a bathroom which is likely to lead to problems with damp. 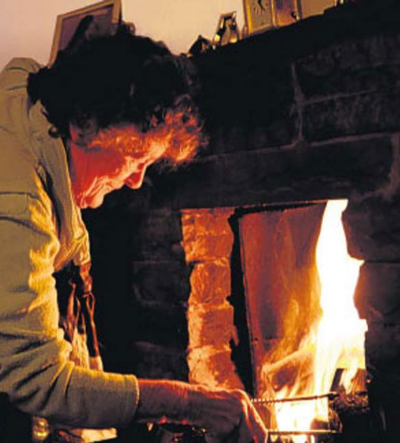 Most houses appear to have their central heating and hot water pipes installed without insulation. In this example the pipe is heating the ceiling void between joists above a ground floor room, which is not a serious problem, but something which should be rectified next time work takes place in the ceiling. What is more concerning is that pipes below suspended ground floors are also generally not insulated with much of their heating leaking out through air bricks and heating the outside of the house! It is rare to visit a house and not notice a problem with a loft hatch. The insulation on most loft hatches is typically poor. 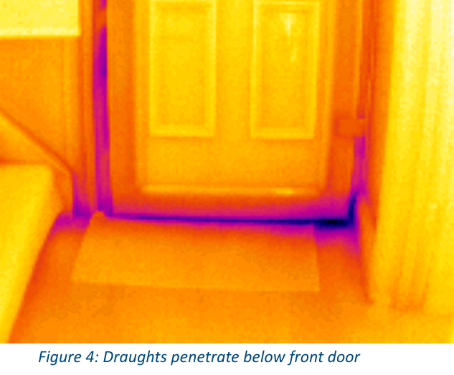 Draught-proofing of doors and windows is one of the most of obvious ways to reduce a home's energy demand. 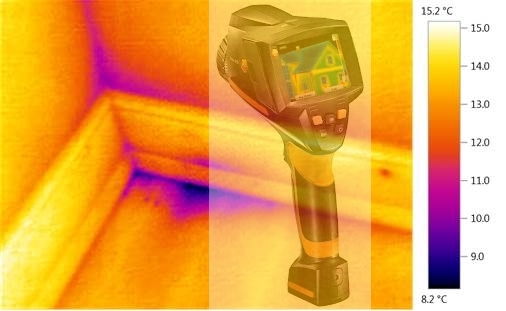 The beauty of a thermal imaging camera is it allow you to quickly identify exactly where the draughts are worst and highlights to owners something they probably already know but had the time or motivation to fix. 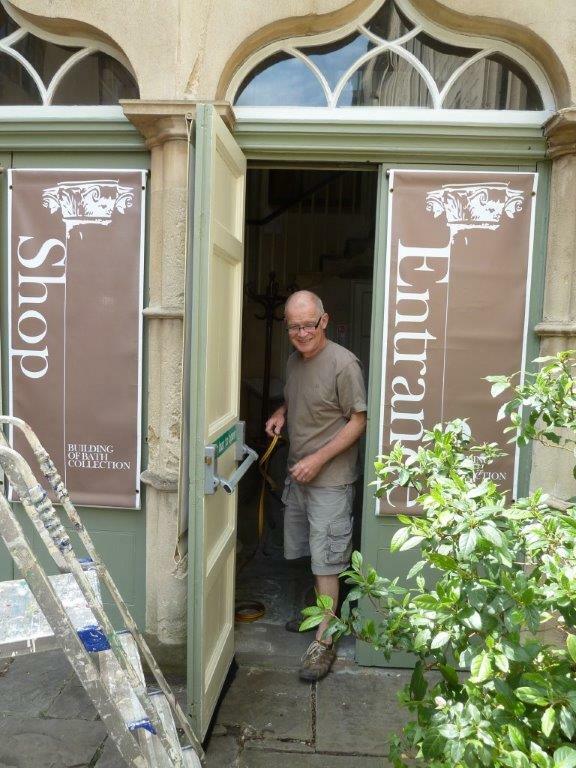 Transition Bath runs regular draught-busting workshops which teach home owners the best way to install draught-proofing on doors and windows and in particular sash windows. We can also supply a variety of draught-proofing materials. The modern fashion for exposed floorboards has lead to older homes becoming less thermally efficient. It is common to see cold rising through gaps between floorboards which is troubling if it is a suspended ground floor. Our general advice is to install draught-proofing - we can supply two types of recommended draught-proofing which is easy to install and is generally invisible to the naked eye. Installation is relatively quick and cheap. A longer term and better solution would be to install insulation under the floorboards, put this if often difficult without lifting the floorboards and can be very disruptive. 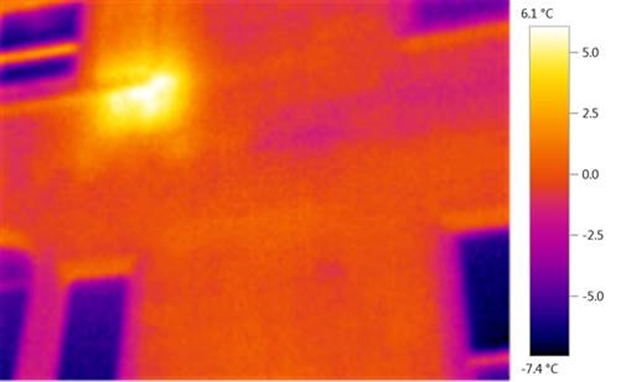 Although not technically something we pick up by using the thermal imaging camera, we are using the opportunity while visiting homes for thermal imaging surveys to praise the benefits of replacing halogen with LED lighting. Does my home leak heat? Is your tradesperson suitably qualified?